Daniil Kvyat leads Daniel Ricciardo and Kimi Raikkonen. The tight streets of Monte Carlo turned out to be the great leveller for Red Bull Racing as they took their best result of the season at the Monaco Grand Prix on Sunday. 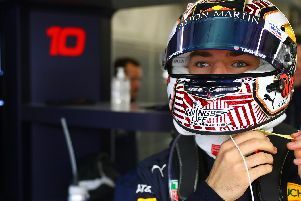 Daniil Kvyat came home a career-best fourth at F1’s jewel in the crown, while Daniel Ricciardo was fifth, but only after he let his team-mate past on the final lap. It was looking fairly routine for the Tilbrook team until 12 laps from the end when Toro Rosso sensation Max Verstappen hit Lotus driver Romain Grosjean, bringing out the safety car. While drama unfolded at the front, with an unexpected pit-stop for Lewis Hamilton relegating him from a comfortable lead to finish third, Kvyat, who had a fairly lonely race to fourth at that stage, was ordered to let Ricciardo through. The Australian, on newer tyres, felt he could mount a challenge on Hamilton and Ferrari’s Sebastian Vettel in front for the podium positions. Hamilton though was resigned to third place, and blocked out Ricciardo’s attempts at getting by. It was Kvyat's best finish as he took fourth in Monaco. A somewhat disgruntled Kvyat asked his team whether his team-mate had made any progress, prompting the team to order to allow his team-mate to repass on the final lap. “I am happy with today’s race,” said the Russian afterwards. “It was my best finish in Formula One and it was a great result for the team to finish fourth and fifth. “I had a good start and was able to control my race from then on. We took a gamble with strategy allowing Daniel past after the last safety car to try and fight for a podium position, as he was on the faster supersoft tyres. “But as he was unable to pass anyone, as agreed, he gave the place back on the last lap. For Ricciardo, his late charge also saw him barge his way past Kimi Raikkonen in the other Ferrari - an incident which was investigated by the race stewards before it was given the all-clear. Ricciardo added: “It was a good race today and a good result for the team. I had some fun in the last few laps trying to get close to Hamilton and Vettel to fight for a podium position. I knew we were in a position to attack in the end which made it exciting I think. The team worked well, Dany let me past to have a crack at the podium and I gave back the place on the last lap when I couldn’t get past Hamilton. “I had a little incident with Kimi and it’s hard to get a clean move without a little contact in Monaco, I appreciate the stewards not taking any further action and I think the crowd and the fans enjoyed it. Team boss Christian Horner said: “It was a great result for the team today and we maximised every opportunity that came our way in the race. “It was all fairly static until the last safety car, which gave us the opportunity to have a free stop with Daniel and put a set of supersofts on the car. He was able to get past Kimi on what was a great move to grab fifth. “As Daniel was on the faster tyre, we switched the cars to see if he could have a go at the two guys fighting ahead, on the understanding that if he didn’t make the place he would give it back to Dany on the last lap.